GORGEOUS LANDSCAPE ALERT: A beautiful two inches of snow has fallen overnight in the Cookeville, TN area. Temperatures dropped more than 15° since midnight here. Road conditions can be described as hazardous. TDOT and County road crews are working hard all over the region. Obviously, schools are closed (many for the President's Day National Holiday). While we do have some morning sunshine, that will give way later to cloudy skies with more snow developing. We expect another inch by later this evening. Full forecast below. TENNESSEE: SNOW AMOUNTS: Lists from the NWS and CoCoRaHS. Highest amount just before 7 am is: 4.5" from Cumberland County. Most totals range from a trace up to 4" via CoCoRaHS observers. Obviously, the snow is the big story. Morning reports show many accidents in the Nashville area. Listening to the scanner here in Cookeville and Putnam County reveals a number of accidents and incidents as well. Overnight tonight, we should expect road conditions to be hazardous once again. The makeup day (today, President's Day) for Putnam County's school kids didn't go as planned. Did you see the story from a few days ago? 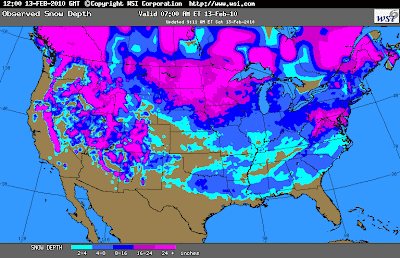 Snow on the ground in 49 states. Actually, it is all 50 states, but an official reporting station in Hawaii wasn't high enough in the mountains to get a recorded amount. High temperatures for February, thus far, are 10° below normal.